I miss bagels. Obviously, being from Montreal, I’m used to good bagels, but I feel like even there, it was possible to get decent bagels from the grocery store bakery. Here, it’s just not happening (and where a bagel from Fairmount is still something like CAN$0.70, at our HEB they go for a whopping US$1.40 a piece – and they’re not even good!). So I decided to try my hand at making some. 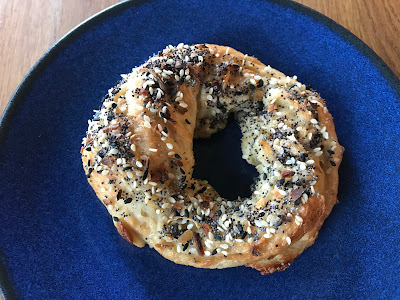 I used a recipe from Dolcetto Confections because it was fast: it calls for instant yeast instead of active yeast, so you can make the whole thing in one go without rising time. I topped half of them with sesame seeds and the other half with “everything”. In the end, while they were good, I found them to be too salty as well as too tough and chewy on the bottom as they aged, which happened *very* quickly. Really, they don’t keep – I’d recommend you slice them and freeze them as soon as they are cool enough to handle after baking. I think next time, I’ll try the Serious Eats recipe. 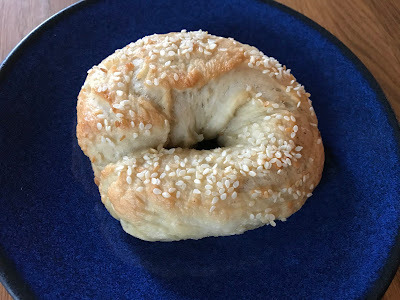 So I’m glad I have an alternative to storebought bagels, but I’m still not very happy with this recipe. My recent batches of spinach muffins were more satisfying. Preheat oven to 425 °F. Line a baking tray with parchment paper. In the bowl of a stand mixer fitted with the dough hook attachment, whisk together flour, sugar, salt, and yeast. Start the mixer on a slow speed and begin to stream in the water. Increase speed to medium-high and knead until dough begins to come together. Turn out dough on a lightly floured surface. Knead by hand until a smooth, barely tacky dough develops, adding additional flour as needed. Form into a ball, cover with the mixing bowl, and allow to rise for 10 minutes. While the dough is rising, bring a large pot of water to a rolling boil and add 1 tablespoon sugar. After 10 minutes, divide the dough into 8 pieces (if you are using a kitchen scale, each piece should be about 4.3 ounces). Roll each piece into a log, about 10-12 inches long. Wrap log around the palm of your hand and lightly moisten one end with a dab of water. Squeeze ends together, roll lightly on counter to secure ends, and release from hand. Repeat with the remaining dough. Drop bagels into the boiling water, up to three at a time. Carefully run a slotted spoon under bagels to release from bottom, if necessary. 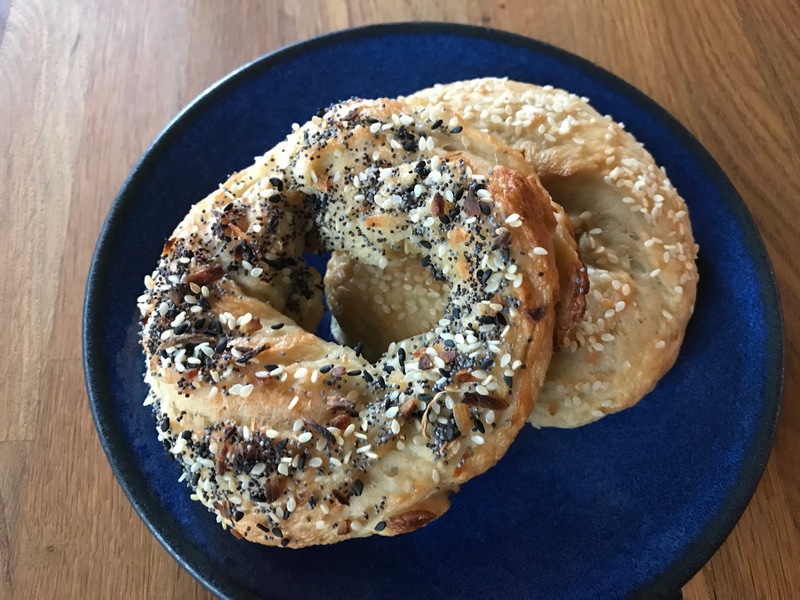 When bagels rise to the top of the pot, remove and place on prepared baking sheets. Sprinkle with topping. Bake until the bagels are well-risen and golden brown, about 20 minutes. Allow to cool for a few minutes before serving.